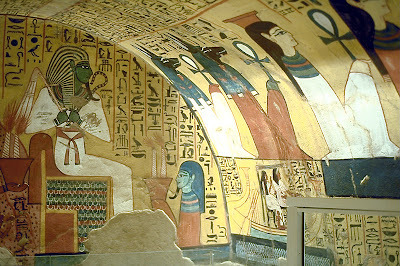 Pashedu was the Servant in the Place of Truth under the later Ramessides. A steep staircase leads to a vaulted corridor, with Anubis depicted on each wall, and the burial chamber where the sarcophagus, unusually made of limestone slabs rather than a single block of stone, stood against the rear wall. 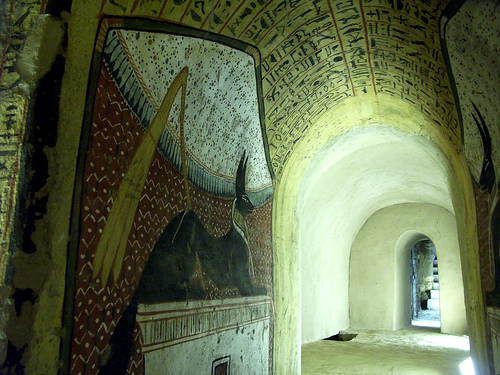 The two long walls are decorated with conventional scenes of Pashedu and his relatives adoring the gods. The most noteworthy scene is on the right-hand entrance wall, where the deceased crouches in prayer beside a decorative palm-tree which grows by the side of the lake.